We had a surprizing good night, our first night sleeping at campII, Nido de Condor, at 18,300ft. or higher even. No headache to speak of this morning when everyone woke up, appetites are really good, really keen appetites, everyone is eating very well, of course Maria’s quality cooking has a lot to do with that. I introduced to this group the idea of pressure breathing, taking a full exhaling and taking a very deep breath and do that for 5 minutes at a time to release their lack of oxygen and there was surprise report today that Jason and Scott were talking about it, pressure breathing for 5 minutes and watching your O2 saturation go up by 15 points. I think that everybody tried last night and in fact they slept well and had a good night. It was a long night, we go to bed early. There is no wind to speak of here but it is very, very cold temperatures, way below freezing here at high altitude and of course we feel it more strongly because of the lack of oxygen. Now last night Sergio, Javier and Efrain were all down at Plaza de Mulas. Sergio has gone down to make sure that Mac’s transfer by helicopter went well; Mac finally flew out at 8:30pm and I actually talked to him by satellite phone connected through land line to his cell phone as he was driving back, land line phone in Canada connected to his cell as he was driving back with Mati, our driver who picked him up, to take him back to Mendoza. So we know that he is at the Hyatt hotel enjoying city life, we miss him very greatly, just as we miss Woodie and Mathes. We are happy to know that they are all probably together at breakfast this morning in Mendoza. The team went up today, to the halfway point between here and Berlin Camp, which we call Nicky’s rock. They did great, first exposure to climbing above here, in their crampons, it went really well. This is not a team overall whose had a great deal of crampon experience, they did really well and Danny is wearing Mac’s 8000 Olympus Mons boots which Mac said you should try this out for the summit when he left and Danny is really happy to have those great high altitude boots on his feet as he climbs higher on Aconcagua. 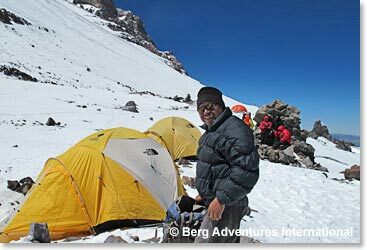 Osvaldo, Efrain and Sergio went on up with some loads to camp III, Berlin Camp, our high camp. He said it looks good, it is clear of snow. Of course it is going to be cold up there, we hope not windy. We are moving up to go to bed up early tomorrow night and if conditions are good, try for the summit day after tomorrow. I think they are going to be good, our weather reports are encouraging. 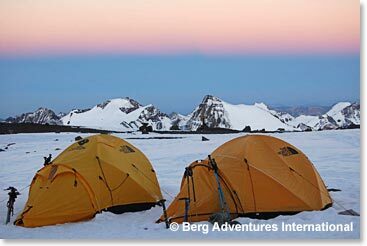 Yesterday it showed high winds on Aconcagua which we always have up near the summit. But it looks to me like the 18th is going to be our summit day and we will certainly give everything we have, we will keep you posted how things look at high camp and we will give you a report tomorrow as we are settling down getting ready for our summit attempt of Aconcagua.